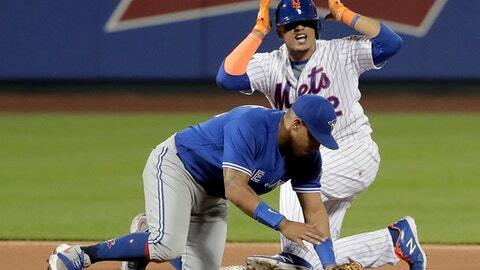 NEW YORK (AP) Juan Lagares and his Gold Glove are probably gone for the season. The part-time New York Mets center fielder is expected to miss the rest of the year because of an injury to the big toe on his left foot. The team announced Friday that Lagares had an MRI and is tentatively scheduled for surgery next week to repair a complete tear of the big toe plantar plate, which is a thick supporting ligament. Lagares, a 2014 Gold Glove winner who was off to a fine start this season, got hurt Wednesday in the ninth inning of a lopsided loss to Toronto when he ran into the outfield wall to make a catch. ”It’s going to hurt us a little bit. We counted on Juan off the bench at times. He was probably in a situation where he was going to get to start playing a lot more than he had, with some guys out,” Callaway said. It’s the latest blow to a sputtering Mets squad hit hard by injuries for the third consecutive year. Lagares joins left fielder Yoenis Cespedes, third baseman Todd Frazier and catchers Travis d’Arnaud and Kevin Plawecki on the DL. All five are right-handed hitters, leaving New York not only dangerously thin in the outfield but also particularly susceptible to left-handed pitching. Heading into Friday night’s game against Arizona, the Mets were batting .201 with a paltry .563 OPS against left-handers. Frazier was eligible to come off the disabled list Friday but is day to day with his strained left hamstring. ”I think initially we were hoping that he would maybe be playing in a rehab game today, but he just isn’t there,” Callaway said. Slumping at the plate and inconsistent on the mound, New York (21-19) is 10-18 following an 11-1 start. An elite defender who started regularly against lefties, Lagares was 9 for 30 (.300) with a .364 on-base percentage versus southpaws this season. He was hitting .339 overall with no homers and six RBIs in 59 at-bats. He also had three stolen bases. As usual, Conforto started in center Friday against Arizona right-hander Zack Godley. But the Mets face tough lefty Patrick Corbin (4-1, 2.53 ERA) on Saturday night and all three of their natural outfielders on the active roster, including Jay Bruce and Brandon Nimmo, are left-handed hitters. Callaway, with a bit of a chuckle, said Conforto will need to play center every single game. Wilmer Flores and rookie utilityman Phillip Evans, both infielders by trade, would be the most likely candidates to sub in the outfield if needed. Lagares was placed on the 10-day disabled list, retroactive to May 17, and left-handed reliever Jerry Blevins was reinstated from paternity leave after his wife, Whitney, gave birth Monday to their first child, a boy named Ellis. The 29-year-old Lagares, who went 8 for 23 (.348) and scored seven runs during the 2015 postseason, has had trouble staying healthy the past few years. He began last season on the DL with an oblique injury and was sidelined from June 16 to Aug. 9 with a broken left thumb that required surgery. He sprained the same thumb in 2016 and was out from June 16 to July 2 and again from July 29 to Sept. 16. He had surgery on Aug. 1 to repair a torn ligament. Lagares also was on the disabled list twice in 2014, with a strained right hamstring and a right intercostal strain. His season ended on Sept. 16 that year because of a hyperextended right elbow. Lagares is signed through 2019 and due $9 million next season.